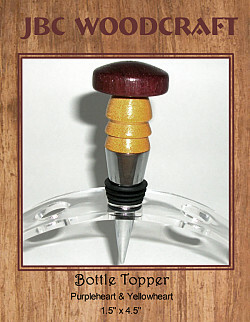 Preserve your favorite wine with this one-of-a-kind bottle topper by JBC Woodcraft®. This contemporary design is handcrafted from Purpleheart and Yellowheart. The high-profile chrome finish gasket provides an air tight, leak resistant seal that snugs securely on top of the bottle neck.